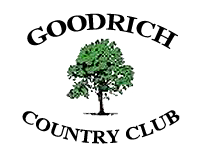 The Goodrich Golf Club wants to be the course of choice for golfers seeking the highest level of golf at a reasonable price. We offer a rustic clubhouse with a beautiful 120-acre, 18-hole, par 70, 5,500-total yards, semi-private well-manicured golf course with rolling hills, streams and ponds throughout. Our course can accommodate corporate, fund-raising, and miscellaneous outings of any kind. Most packages can be customized to fit your needs. Memberships can be purchased for voting member’s & students. Our snack shop & Pub at the Goodrich Golf Club can furnish you with all the necessary foods and beverages, and the pro shop can assist you with a variety of golfing items.